In Part 4 of a 4-part webinar series on Wednesday, October 10, 2018, from 2–3 PM EDT, Shayna Komar RD, LD, and Chef Nancy Waldeck will present seasonal and distinctive flavors from herbs and spices that work well together, to the many health benefits a client can receive from adding them to their daily cooking. 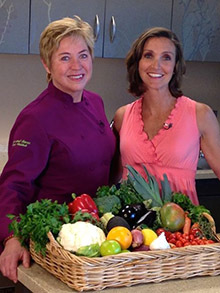 Shayna and Nancy will provide recipes, tips, and ideas for RDs to use to guide their clients in using seasonal produce. They will highlight apples, pears, kale, mushrooms, winter squash and pumpkin.